"A loan? What I want is to continue at Barcelona. It's the club of my life, of my parents, of all my family... If I can choose, I will stay at Barça." Riqui Puig likes to take the initiative on the pitch. And also off it. He made it clear after the draw against Huesca: he prefers to fight for a first team place next season than leave on loan. It's not an easy decision for Barça, where there are doubts about what step to take with Riqui Puig. The midfielder showed against Huesca, with minutes, that he can have a positive impact on the team. But there's an overbooking in midfield at Camp Nou. As we wait and see what happens in the summer, Barça have Busquets, Rakitic, Vidal, Arthur, Aleñá, De Jong, Rafinha and Denis. In addition, Coutinho and Sergi Roberto can also play in midfield. 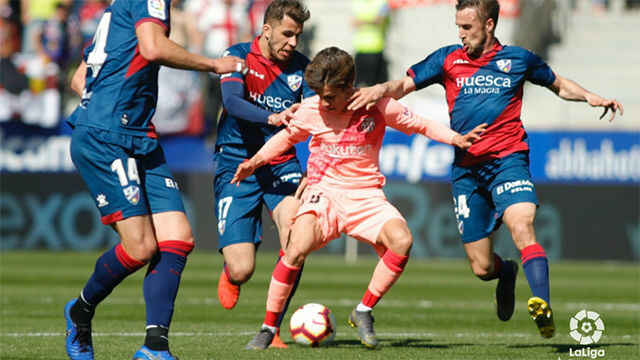 Some of those players will leave, but the scene still is complicated for Riqui Puig. The club aren't sure what the best option is for his career. If he stays in the first team, in his first season with them, his minutes will mostly come in the Copa del Rey. It seems less likely, though, that he remains with the B team in Segunda B, a competition which doesn't favour his style of football. Another option is a loan move to a club which fits his game. That's where Ajax come in, a club that Barca have a great relationship with after the Frenkie de Jong move. Riqui Puig turns 20 in August. Next season is the next level with him. As Barça wait to see what happens with the B team -- they could still get promoted -- there is unanimity that he needs to take the next step this summer. Barça coach Ernesto Valverde is closely following his evolution -- the club highlight his interest in the player -- but to find a place in the first team various players will have to leave at the end of the campaign.